The system is designed to aid the driver. It is not intended to replace the driver’s attention and judgment. The driver is still responsible to drive with due care and attention. The system detects unintentional drifting toward the outside of the lane and alerts and/or aids the driver to stay in the lane through the steering system and instrument cluster display. The system automatically detects and tracks the road lane markings using a camera that is mounted behind the interior rear view mirror. The system works above 40 mph (64 km/h). The system works as long as one lane marking can be detected by the camera. If the camera is blocked or if the windshield is damaged, the system may not function. When Aid mode is on and the system detects no driver steering activity for a short period after system activation, the system alerts the driver to keep their hands on the steering wheel. The system may detect a light touch or grip on the steering wheel as hands-off driving. center console to switch the system on or off. Note: The system on/off setting is stored until it is manual changed, unless a MyKey® is detected. If a MyKey® is detected, the system is defaulted to on and the mode is set to Alert. Note: If a MyKey® is detected, pressing the button will not affect the on/off status of the system. Only the Mode and Intensity settings can be changed when a MyKey® is present. The system has one standard feature setting and one optional setting menu available. To view or adjust the settings, refer to the Information Displays chapter. The last-known selection for each of these settings is stored by the system. You do not need to readjust your settings each time you turn on the system. Mode: This setting allows the driver to select which of the system features will be enabled. Alert only – Provides a steering wheel vibration when an unintended lane departure is detected. 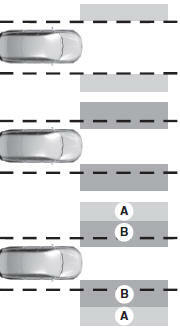 Aid only – Provides a steering input toward the lane center when an unintended lane departure is detected. Alert + Aid – Provides both a steering wheel vibration and input toward the lane center when an unintended lane departure is detected. Note: The alert and aid diagrams are meant to illustrate general zone coverage. They are not intended to provide the exact zone parameters. Intensity: This setting affects the intensity of the steering wheel vibration used for the alert mode. This setting does not impact the aid mode. When you switch the system on, an overhead graphic of a vehicle with lane markings will be displayed in the left instrument cluster display. after you switch the system on, arrows will be displayed with the lane markings. When you switch the system off, the lane marking graphics will no longer be displayed. Note: The overhead vehicle graphic may still be displayed if adaptive cruise control is enabled. While the system is on, the color of the lane markings will change to indicate the system status. 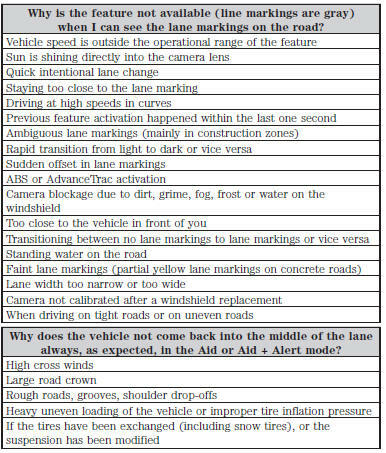 • the camera is obscured or unable to detect the lane markings due to environmental conditions (e.g. significant sun angles or shadows, snow, heavy rain, fog), traffic conditions (e.g. following a large vehicle that is blocking or shadowing the lane), or vehicle conditions (e.g. poor headlamp illumination). Green: Indicates that the system is available or ready to provide a warning or intervention, on the indicated side(s). Yellow: Indicates that the system is providing or has just provided a lane keeping aid intervention. Red: Indicates that the system is providing or has just provided a lane keeping alert warning.